T he current edition of Irish Runner, published 21st February, has a feature on barefoot running. I was interviewed, along with a number of other runners, who are making the transition to barefoot running techniques and footwear. Check out an edited version of the article below, or grab a copy of Irish Runner – it’s a great value magazine with tons of Irish running news. So after 6 months why am I still running barefoot? Isn’t it just a fad? I think the mistake many people make when they think about “barefoot running” is thinking about fears: “but my calves will hurt” or “what about broken glass on the ground” or “nobody else is doing it.” I believe you need to think about it more broadly than that – it’s more a philosophy about running technique, physiology and your mental approach rather than just the footwear. Footwear is just a tool – in the same way you wouldn’t expect to shoot 5 birdies around Ballybunion, just because you bought Rory McIlroy’s latest set of Nike golf clubs. Without the technical skill to swing a golf club correctly, which you learn over time, and then practice a lot, you couldn’t expect to be a single handicap golfer. No matter which golf clubs or balls you use. If you’re a triathlete, think about swimming – body size, goggles or even physical fitness don’t influence performance that much. The fundamental differentiator is swimming technique. That’s why we all get swimming lessons. But how many of us ever got “running” lessons? I don’t think such a class even exists! The barefoot or natural movement philosophy addressed that gap for me. Like many people, I read with amazement at the adventures of El Caballo Blanco in “Born to Run”. Following on from that I attended a 2 day workshop hosted by ChampionsEverywhere in Glendalough which was a really amazing experience. I learned so much about our bodies, our minds and our technical running skills. It really invigorated me to learn more. “Born to Run” might be a bit romantic, thinking we can all transform into ultra-marathon runners overnight. The Glendalough course made me understand, that yes we can achieve huge potential, but it takes time, and natural movement principles from barefoot running can help along that journey. So what progress have I seen since then? Well, I bought 2 pairs of Vivo Barefoots and use them for over 90% of my running now. I spent at least 5 minutes a day doing various natural movement drills such as toega (toe drills) and improve my flexibility at a weekly circuits class on natural movement. I really enjoy running in my Vivos now and find them very comfortable. I can run for 1-2 hours and I don’t experience pain or discomfort after. My next big decision is when I race in them – I’m training for the Boston Marathon in April so my goal would be to have the confidence to run in them for under 3 hours. Would my technique be strong enough by then to maintain my body form and run correctly? It’s a challenge I’m committed to completing. What have I learnt since I started my barefoot journey? I take your point, Hi! so I got into golfing and me and my dad is going to the field weekly. And way.. I am hitting 120 with 7 iron and 220 with my driver. My coach tells me that it is little small for me and tells me that I should get the size that he have. I used my dad’s clubs (HONMA BERES MG-703 2 star) and it is comfortable. He tells me that I should get adult size. We were looking at ebay for some callaway x18 or x20. But I want to know if there is any other good iron that wasn’t released not too long ago(around the time x 18 or 20 was released) not very expensive (around 200dollar at ebay[in good condishion hopefully..]) and forgiving. I know callaway is good choice but I want to see other choices. I full set of x18 sold for 170 but slept too late to bid at the last moment… anyways.. Thanks! 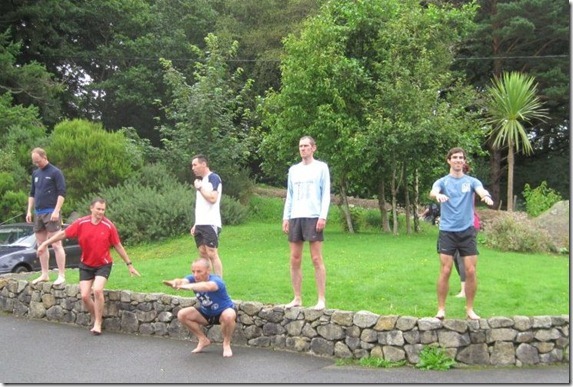 Thanks for the mention of Barefoot running, but the Irish Runner have made a mistake. It was not Nike who invented the first barefoot shoe it was my son Tim Brennan.